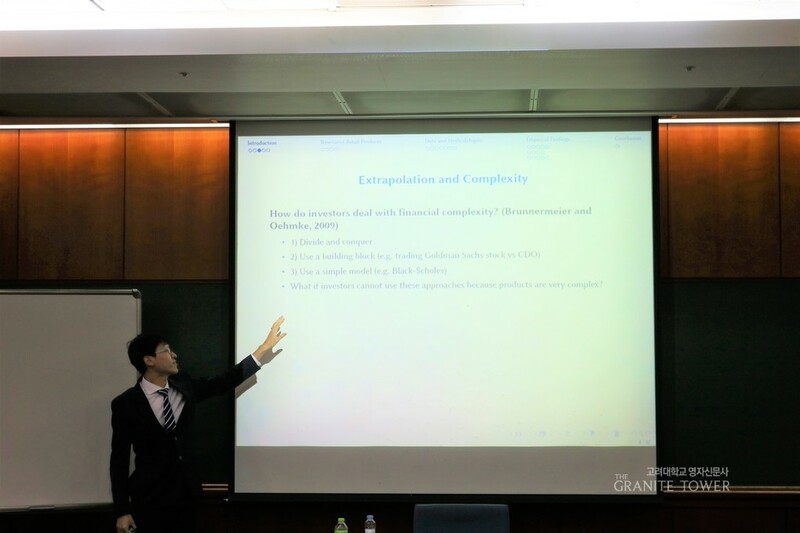 On November 30, Donghwa Shin, a candidate for Doctor of Philosophy (Ph.D.) of the Department of Economics of Princeton University, was invited to a weekly lecture session held by Korea University (KU) Business School and gave a presentation on “Extrapolation and Complexity” at the LG-POSCO Hall. During the lecture, Shin tempted to explain thoroughly about the rapid growth in sales volume of structured retail product (SRP) market in terms of extrapolation and complexity. Shin began his speech by stating, “SRPs are complex retail financial products which package exotic options and bonds.” He added that anyone in Korea is easily accessible to this market through brokers who usually give a recommendation based on risk appetites. There are several examples of SRP, but according to Shin, the most important and complex one among those is Autocall, which is issued by the Hongkong and Shanghai Banking Corporation (HSBC). His research study showed that there is a global trend towards a drastic increase in structured retail products, especially Autocall, which is complex to an extent that it cannot be either decomposed into pieces or formed into building blocks. From the equity-linked SRP samples, Shin induced that people extrapolate to buy more SRPs that are more complex, which is usually harder to understand and predict, thus responding more aggressively to the past returns in purchasing. This means that people tend to buy more SRPs that provide higher returns in the past based on the assumption that the product exhibits high complexity, which are usually SRPs. Therefore, this leads to a downfall in markup and a growth in issuers that promotes an increased competition among financial intermediaries. Before Shin closed his lecture, he emphasized that extrapolation and complexity are the major factors that explain the rapid growth in SRPs, and the intermediary market has become more competitive as there is a low chance of exploitation due to lower markup and higher transparency. The session was entirely closed with several questions from professors of KU who pointed out that there still need more researches to be conducted to examine the effect of exploitation on the overall welfare of investors.